It’s time for some Theatre Baltimore! 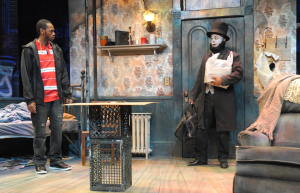 Eric Berryman, Featured Resident Company Member at Everyman Theatre and one of the stars of Topdog/Underdog, stops by to talk about the play in which two African-American brothers were named Lincoln and Booth respectively… as a joke. For more information on the performance and to see it before it closes on May 19th, visit Everyman Theatre for more information.